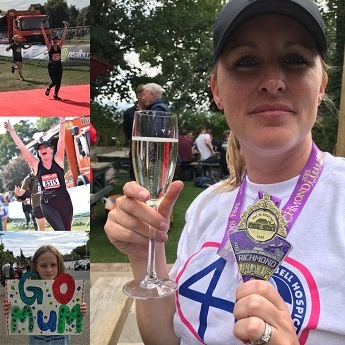 On Sunday 17th September, our Director, Carly Temple, ran the Richmond Half Marathon, in loving memory of her uncle Mick, to raise funds for the Michael Sobell Hospice. Despite the very warm and sunny conditions, Carly completed the race in a fantastic time of 2 hours 26 minutes! This was Carly’s first half marathon and all the training certainly paid off! “It was very nerve-racking waiting for my race number to be called to the start line. My start time was 09.13am. I heard the claxon and said to myself, ‘this is it, this is what I have been working towards, I can do this’. Carly’s Uncle was a special, selfless man. He dedicated his life to caring and always looked after those in need. He was a Samaritan, a bereavement councillor and a volunteer at the Michael Sobell Hospice. “I grabbed a Lucozade from the drink station and just tried to focus. When I finally saw the finish line ahead, the crowds were clapping and cheering, I found my last bit of energy! At the finish line I saw my husband and children along with other family members and I just starting punching the air and shouting I did it, I did it!!! It was completely overwhelming. I am so, so proud of what I achieved. All the solo runs, hard work and determination paid off. Carly has raised a fantastic £866 to date. Her JustGiving page can be found here. The funds go towards the hospice, run by amazing Doctors, nurses and of course very special volunteers, like my Uncle. Carly is one of the Directors at Carshalton Boilers. We are a family run plumbing and heating business that cover South London, Surrey and surrounding areas. For more details: click here or call on 0208 3958060.